PokerStars is probably the biggest poker room online. It has an easy and very comfortable interface, a large variety of poker rooms and games to play, and of course a team of professional players to play against. At PokerStars you will find among thousands of players. You can play against easy players, but might also find competing with aggressive veteran players. 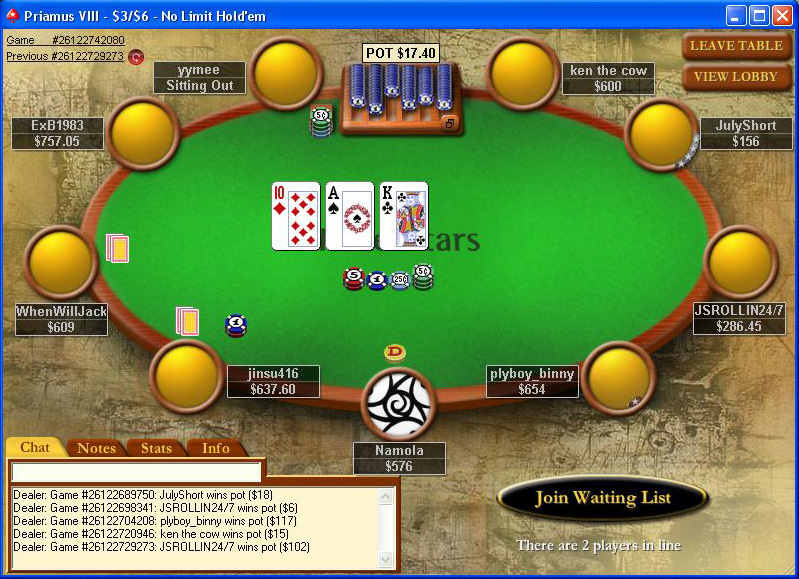 Here you will learn to play against all possible players and to use all poker strategies in poker. You will never be bored and no single game will be the same as the next one. PokerStars offers more poker games than you can imagine! Here you will find 12 different types of card games to choose from. 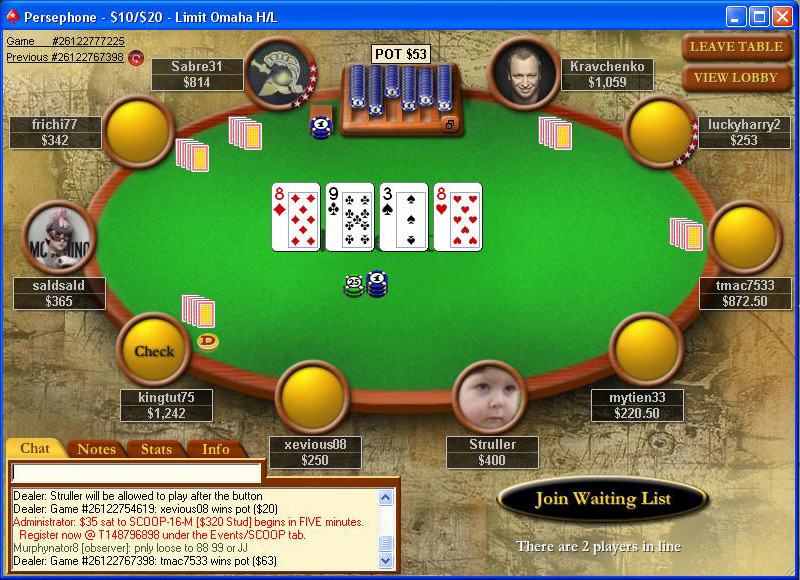 Whether you want to play Texas Hold'em or Omaha, here you will find every game and in various stakes. Additional games to choose from are Stud, Stud High Low, Razz, 8-Game Mix and even Badugi. So just take your pick, take your seat and start earning money! The rooms range from $0.01/$0.02 up to $200/$400. You can always begin at the low stakes, get some confidence and practice, and then move to higher stakes and win the big money. Fast rooms are also available, where one must act within eight seconds only. Click the images to view their full size. Click on their right or left side to view the next or the previous image. Deposit Options: Visa (Delta, Electron and Prepaid), MasterCard, Neteller, Diners Club International, Moneybookers, ClickandBuy, eCheck, Local Bank Transfer, online Bank Transfer, Paysafe card, WebMoney. Withdrawal Options: Visa, Neteller, Moneybookers, ClickandBuy, WebMoney, Check, Direct Bank Transfer. The PokerStars staff is very warm and welcoming. All e-mails are responded quickly and in a supporting and a professional manner. Do not hesitate to ask whatever is on your mind, any problem you might have will be addressed and taken care of. The best thing you can find on PokerStars is the tournaments. There are tournaments with prizes as high as $6,000, $35,000 and even $100,000! You can also test your skills in freeroll tournaments, where you enter for free and try to win a spot in a next tournament with a $2,000 prize pool. PokerStars holds many famous tournaments such as $1 Million Dollar Takedown, Sunday Million, $30,000 Guaranteed, PokerStars rakeback and much more. PokerStars also runs satellites to most major poker events in the world such as the European Poker Tour (EPT), the World Series of Poker (WSOP), the PokerStars Caribbean Adventure and many others. Aside from the variety of tournaments, you would find here many Sit-N-Go (SNG) tables to choose from. You can find regular and turbo tables of 6 players, you can play heads-up against another player in a 2 seats table, or join a multi-table SNG competition, whether the prizes are even higher. Once you deposit money in PokerStars, you will be eligible to receive 100% of your deposit up to $600. Deposit some money, win some more and also receive your deposit back with PokerStars bonus. Enter the PokerStars marketing code when creating your account and get a 100% bonus up to $600 as a new player. PokerStars adds more and more professional players and its team includes more than 30 known and new poker pros from all over the world. The PokerStars software includes a "Find a Team PokerStars Player" option that searches for the tables where your favorite pros play. You can join the rooms with them, chat, play against the pros and sharpen your skills. Some of the names you will find are "Kid Poker" Daniel Negreanu, Chris Moneymaker, Alex Kravchenko, Barry Greenstein, Joe Hachem and even the new editions from the latest final table of the World Series of Poker 2008 - Peter Eastgate, Ylon Schwartz, Dennis Phillips. PokerStars always searches for new players and new talent. Becoming a member of their team is a great honor and great respect - and who knows, maybe you are the next big thing and one day you will proudly take your place among the PokerStars pros. - Your main goal will be winning money and making your bankroll bigger, but in the process you will also earn Frequent Player Points (FPP). The more you play, the more points you win. With these points you will be able to enter many tournaments and satellites without paying any additional entry fee. 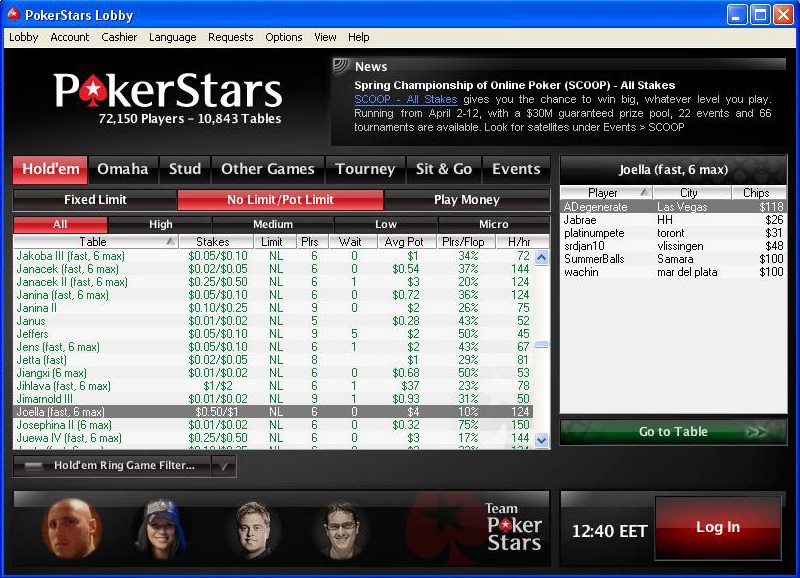 - Another great feature on PokerStars is the store. You will find many products in the PokerStars store, from books, DVDss and clothing to electronics, gadgets and even gift certificates. No need to pay money for these items - you get them with the points you earn. So the more points you earn, the more items you can buy. - PokerStars has the largest variety of tournaments with big prize pools. - Million Dollar Men Freerolls. Enter any of the free daily qualifier tournaments for a chance to play against the Million Dollar Men for a huge and guaranteed prize pool! - Finding a poker player or even a poker pro has never been easier! You just click on "Find a Player" or "Find a Team PokerStars Player" and you get the list of all players and where they play at the moment. - Another great feature is getting your playing statistics to your mail by a single click. It can help you analyze your play, learn from it and then return to the tables better than ever.